The average Indian is accustomed to the sight of public walls defaced with loud movie posters, job postings, paan stains and if they are lucky, a beautiful mural or graffiti wall by independent artists and citizen activist groups like the Ugly Indian. 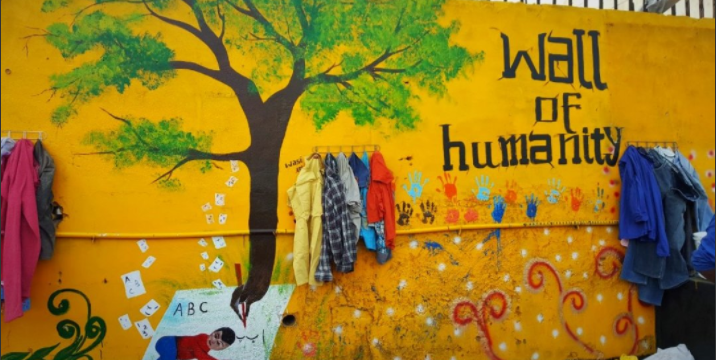 But for the past few weeks, Indian cities, particularly small towns across North India have woken up to see walls that serve as a beacon of hope and human kindness. 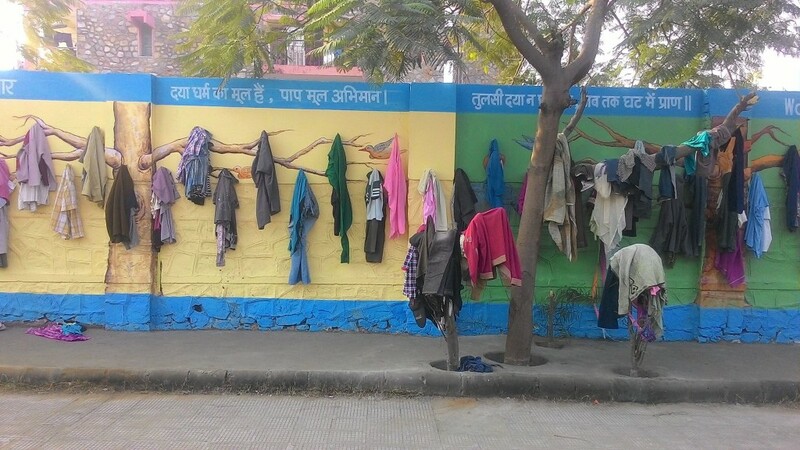 Citizens in a collaboration with local authorities across cities have designed walls called ‘Neki Ki Deewar’ that work on a “Take what you need, leave what you don’t” concept where people can leave old clothes, footwear, blankets and other items of use that can be taken by anyone, no questions asked. The walls are beautified with murals, and embedded with nails that hold the clothes in place. Words of encouragement and motivation are painted on the walls to demarcate them for their special use. The idea has been adapted from the West where certain areas in the city are designated for leaving out old clothes and other household items for the poor and homeless to help themselves to. Similar walls were created in Mashhad, Iran during Christmas last year. 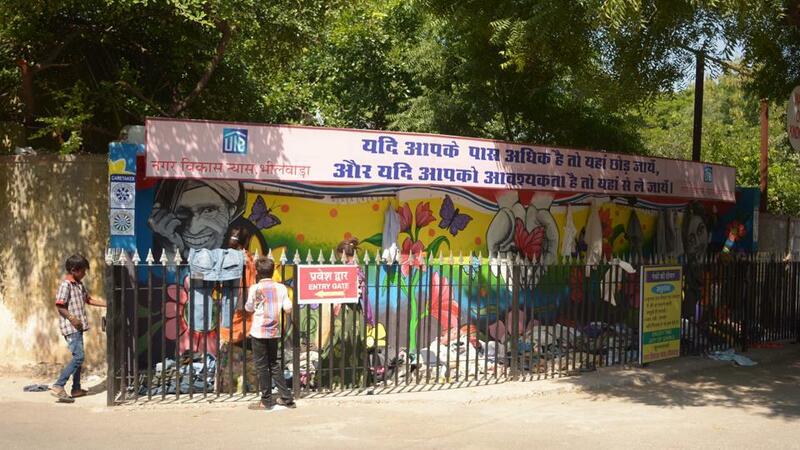 Four colourful walls of kindness have come up in the small textile town of Bhilwara in Rajasthan within a few months. Here the clothes and other items found on the walls would be regularly collected and washed and put back in a cloth bank which can then be distributed to the poor. “We are receiving a lot of clothes at the walls and evidently, the givers are many more than the takers,” said Pradeep Singh Sangawat of Bhilwara’s Urban Improvement Trust (UIT). In Jaipur, 3 such walls have been created by the locals in the Bajaj Nagar area. “An initiative in our locality. People can charity used and old clothes, shoes, etc. and poor people can pick their need form there. No watch, no accounting…just a small act of kindness.”, says resident Jayant Jain. In India, old clothes are usually handed down to siblings, house help or donated to orphanages and other rehabilitation centres. But this unique initiative helps things reach the people out on the roads or simply anyone in need, without them having to beg, or buy these clothes. 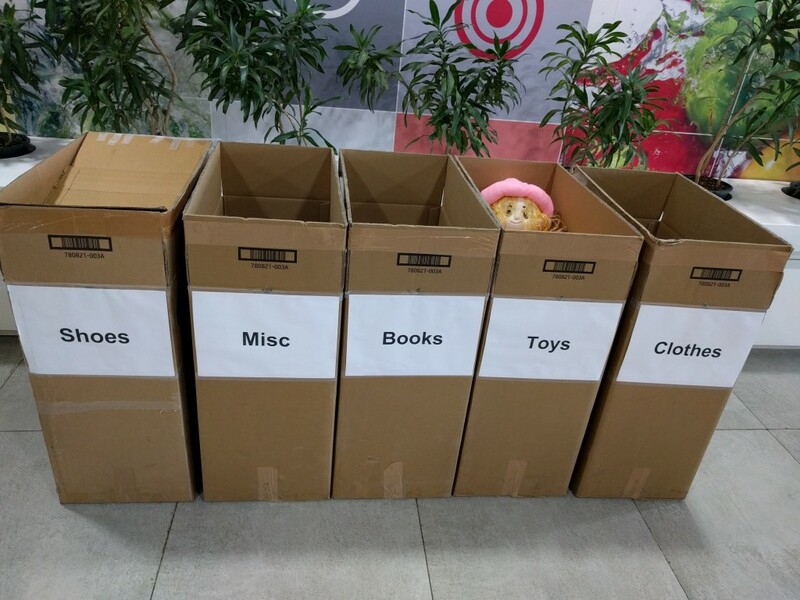 Companies like Google regularly hold donation drives on their premises where employees can contribute old clothes and toys for distribution to charities. But these walls also serve as a dual purpose of preventing defacement and urination, and bring a gesture of human kindness with a simple and creative idea, out in the open encouraging others to share. The writing’s on the wall. This is an initiative worth emulating across cities in the world.